Forensic officers at the scene of a suspected car bomb in Londonderry, Northern Ireland. 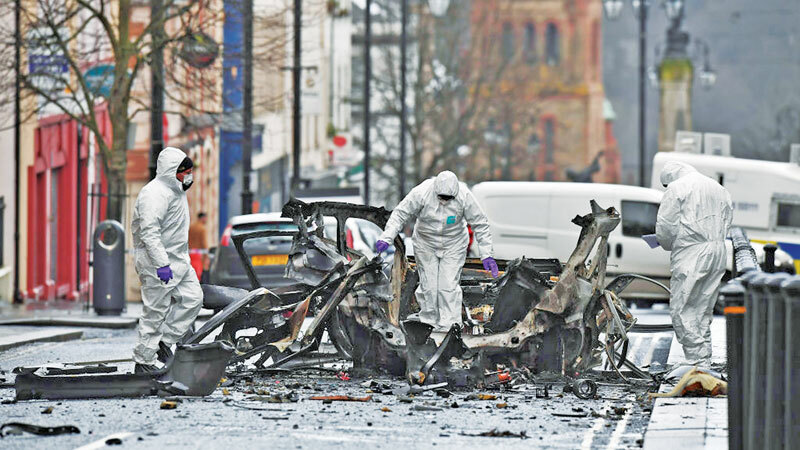 NORTHERN IRELAND: Four men were arrested Sunday following a suspected car bombing in the Northern Irish city of Londonderry, police said who believe a dissident republican group the New IRA to be responsible. Two suspects in their 20s were arrested Sunday morning and then two other men. aged 34 amd 42, were taken into custody in the evening, the Police Service of Northern Ireland said. The suspected bomb exploded on Saturday, as police were evacuating the area following a warning that a device had been planted outside the city courthouse. There were no casualties. “Our main line of inquiry is against the New IRA,” said Police Service of Northern Ireland assistant chief constable Mark Hamilton. “The New IRA, like most dissident republican groups in Northern Ireland, is small, largely unrepresentative, and determined to drag people back to somewhere they don’t want to be. “The people responsible for this attack have shown no regard for the community or local businesses. They care little about the damage to the area and the disruption they have caused.” Police say they believe the vehicle used in the attack was hijacked locally from a delivery driver earlier on Saturday. The warning call was made to a charity hotline in England, before being communicated to local law enforcement in the British province, police said. Londonderry was a consistent flashpoint in the three decades of sectarian bloodshed in Northern Ireland known as the Troubles. But dissident paramilitaries remain active on both sides of the divide. “This attempt to disrupt progress in Northern Ireland has rightly been met with utter condemnation from all parts of the community,” said Northern Ireland secretary of state Karen Bradley.